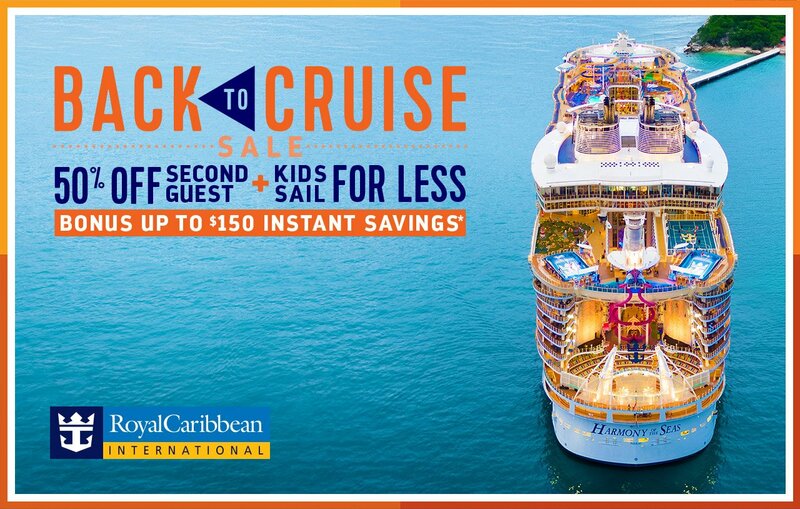 Royal Caribbean is offering instant savings on cruises booked this weekend, on top of the cruise line's August BOGO 50% off promotion. Cruises booked between August 9, 2018 – August 12, 2018 on sailings departing on or after September 9, 2018 are eligible for this offer. Offer now EXTENDED through August 14, 2018. 25% off cruise fare for third guests and higher booked in the same stateroom as the fi rst two qualified guests. BOGO and Deck the Holiday Deals are combinable with each other as well as with Back to Cruise Sale, Fall/Winter Sailings Promo Code Driven Promotion, Free Upgrades, NRBD OBC, promotional OBCs, NextCruise offers, Instant Savings, restricted discounts (for example, Seniors, Residents, Military), Crown and Anchor discounts and Shareholder Benefits. Back to Cruise Sale is combinable with Fall/Winter Sailings Promo Code Driven Promotion, Free Upgrades, NRDB OBC, OBC, instant savings, NextCruise offers, restricted discounts (for example, Senior, Resident, Military) but not combinable with Shareholder benefits and Crown and Anchor discounts. All offers are not combinable with any other offer or promotion, including, but not limited to, Standard Group, Interline, Travel Agent, Travel Agent Friends and Family, Weekly Sales Events, Net Rates.